WE NEED YOU! Hundreds of Volunteers help to make these repairs for homeowners in need possible each year. Skilled or unskilled, YOU can help make a difference in your community by donating your time for one day (or even half a day) this May! Please complete an application and return it by April 25th. A house captain will contact you in early May with information about the home you will be working on. Note: If you feel like you could make a good house captain, taking the lead on communicating with the homeowner or on heading up the repair tasks, be sure to note this on your application! Homeowners in need can apply now for consideration for our May of 2019 Build Day! Priority is given to homes of veterans, senior citizens and low income homeowners. Must be owner occupied and current on taxes. Rentals and Land Contract properties do not qualify. Current funding requires that the property must be within the city limits of LaPorte or Michigan City at this time. Click on the link above for an application. 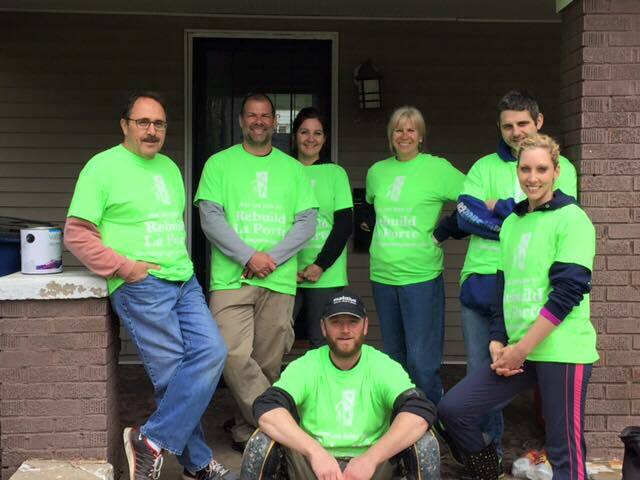 -City of La Porte Engineer’s office, 801 Michigan Ave.
On a Saturday in May, Rebuilding Together LaPorte County will be working on several homes in LaPorte and Michigan City. Volunteers – skilled and unskilled are needed to make that happen! From lunch delivery drivers, breakfast setup, yard clean up, and yes, construction work – we need a variety of skill types to make these homes look nicer and become safer for the homeowners. If you have a passion for helping others and would like to help this year, please submit an application – we will get back to you with your house assignment or other ways that you can help on Build Day in May! The 3rd Annual Build Day for LaPorte County will be on Saturday, May 6th. Homes worked on will be in select areas of LaPorte and Michigan City (City Limits). Volunteers and Homeowners in Need of Repairs can apply online. Follow the links on this site. Homeowner Application #1 is now available online via the link below. Initial applications must be received by December 31st of 2016 for consideration. Upon review, homeowners most likely to be considered for our build day based on location and needs will be contacted for a property viewing and to complete additional paperwork to access qualification. This is NOT extreme home makeover – safety and living standards are the main concerns. Cosmetic issues may be addressed as part of our neighborhood beautification effort, but are not the main mission of Rebuilding Together LaPorte County. Please be sure to tell us as much as you can via the desired repairs section of the APPLICATION.